Catherine Murphy welds each critter into two poses: ready for flight, or ready to nap. There are over 1,000 species of bats in the world, but the rare copper garden bat seen swaying in your rose bushes is unlike the rest. A handcrafted take on our nocturnal neighbors, this friendly sculpture keeps company in your yard, on your porch, or even hanging in front of the kitchen window. Catherine Murphy welds each critter into two poses: wings open, ready for flight, or closed, ready to nap. She then creates an S hook for easy hanging. 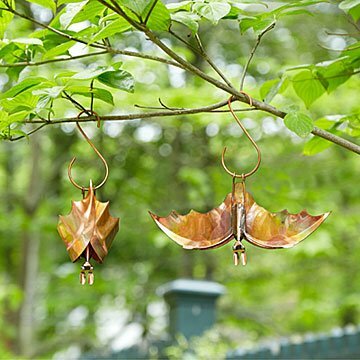 Adaptable to any climate, it's sealed with a protective finish before it "flies" from Catherine's forge in Asheville, North Carolina to your home. Designed for year round, outdoor use. Wipe clean. It is beautiful. Very well designed. Just to0 expensive for what you are getting. It is a lot smaller than anticipated. Perhaps if you but both together? When I need a gift for Caitlin I look in your catalogue first. I rarely have to look farther. For Christmas I ordered her the bat with folded wings. it was so cute that I gave her the other one for her birthday. It joined the first on the chandelier. They are charming and unique. I really love this company and am never disappointed with their products, nor am i am with this purchase but i will say that i agree with a couple other reviews, that the bats are a little smal for the price, which is the only reason i gave it a three star review. Otherwise these little bats are darling! They are well made and unique but just be prepared if you purchase them, they are small. Still love uncommon goods!! The open winged bat was very nice, but for the size, I feel like the cost should have been for the set. I realize they are hand made and cooper, but I still feel as though we could have gotten more for the money. I also did not receive the hook in the packaging. Love love these bats! I bought 2 more bats after first bat. They look so cute sitting on the hanging decor in the corner of the dining room. Three watch us along w copper hummingbirds n flowers that I got from this shop. Very happy w them. Another unique gift for someone who has everything. I have bought many things for my family from your catalogue. I have also recommended you to my friends. It will need to be put somewhere close to home so that it can be seen and fully appreciated. These little bats are adorable. They caught my eye when browsing the catalog. I got a sleeping bat. It looks so cute when watching us inside. Love that! Can't wait to buy open winged bat. Thanks! Very happy w it. My mom loves ornaments and adding detail to her home. This piece is the perfect size and so well made.